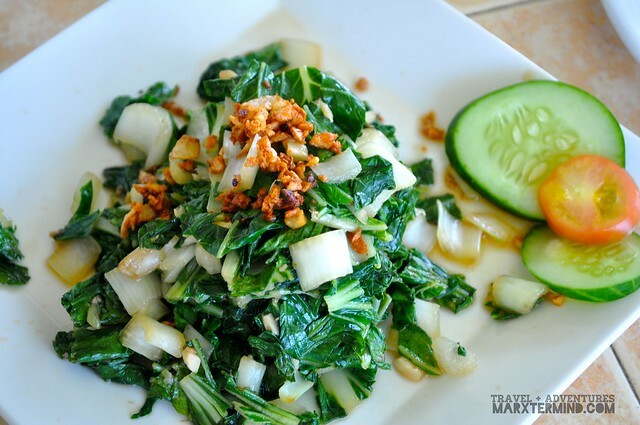 It was 10 days after I return from an out of the country trip when some of my travel blogger buddies and me went to a resort nearby Metro Manila and spent a weekend of rest and recreation. It was exactly what I had needed as I was suffering from a post-vacation blues. You know, only another travel can end such misery. 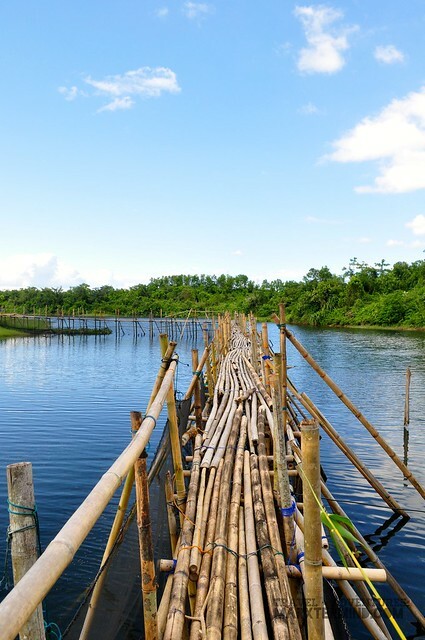 Together with 8 of my travel friends, it was early morning of Saturday when we left the busy city and traveled the road for about 3 hours to reach the area of Caliraya. 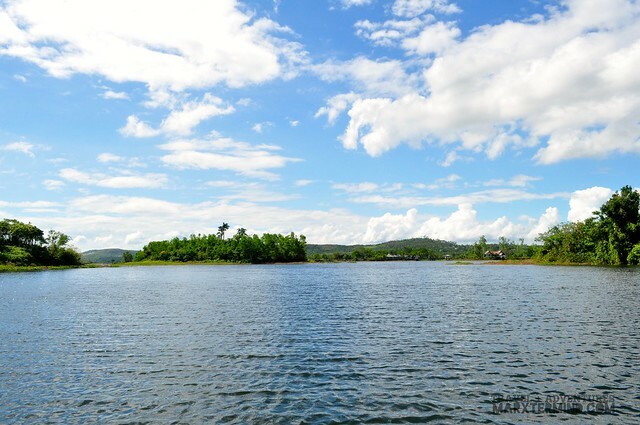 Caliraya is actually a lake, generally known as Lake Caliraya. 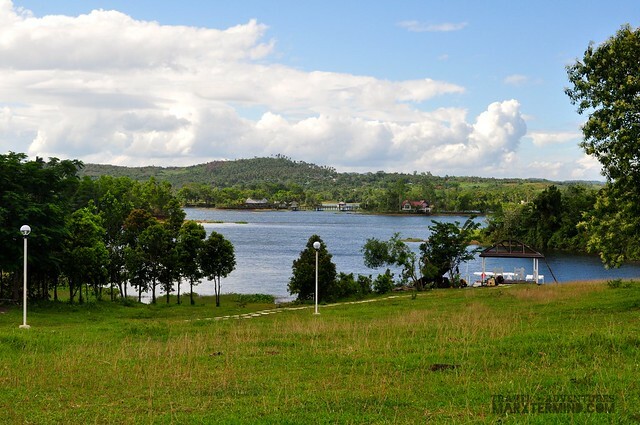 It is a man-made lake situated in the municipalities of Lumban, Cavinti, and Kalayaan in Laguna. 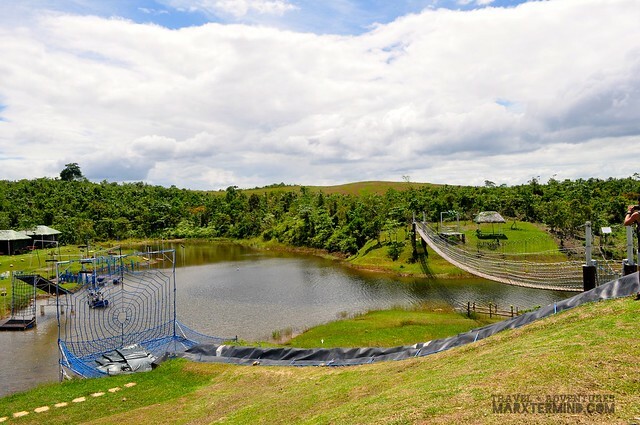 This part of Laguna has now quite a lot of resorts surrounding the beautiful lake, one of which that we’ve found very worthy is the Mountain Lake Resort. 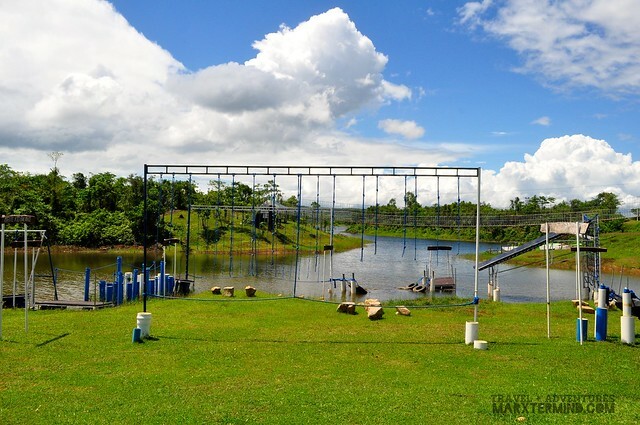 Mountain Lake Resort is a hill resort in Cavinti, which is actually situated inside the Caliraya Springs Golf Complex. The complex is huge. 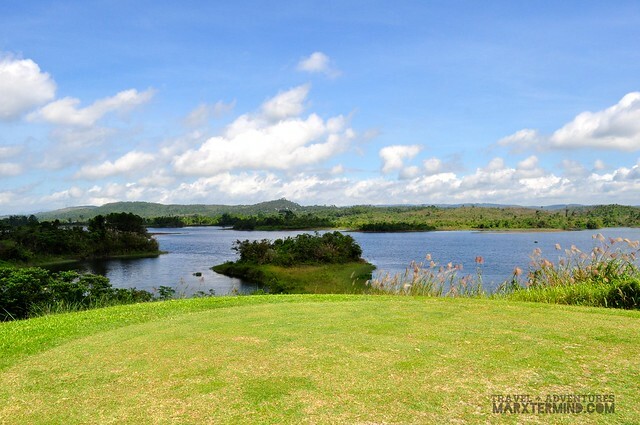 It has a golf course, a lake and a resort. 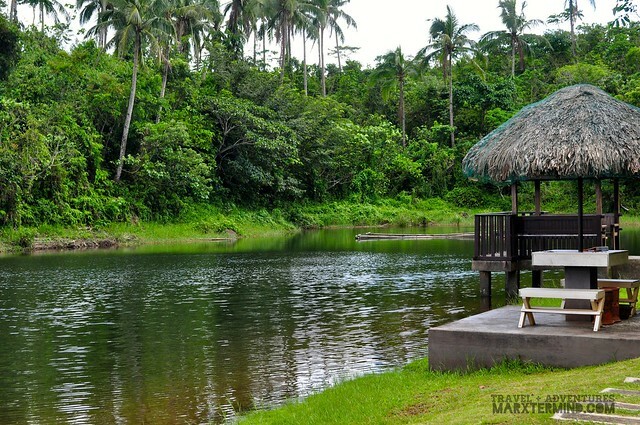 It’s a nice place if you’re looking for serenity and leisure. 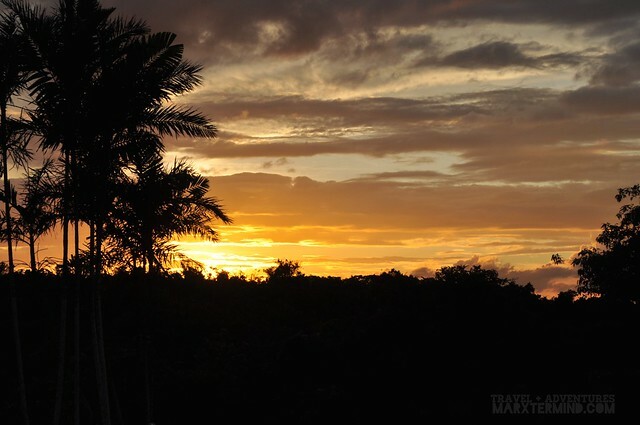 It’s rightly a destination to de-stress – and nurture the tranquil surrounding. Getting to this place is easy. 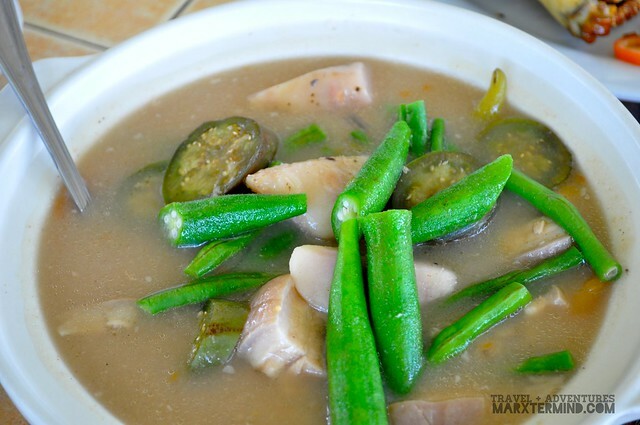 If by commuting, one can ride a bus from Cubao, Pasay or EDSA with a signboard that says Sta. 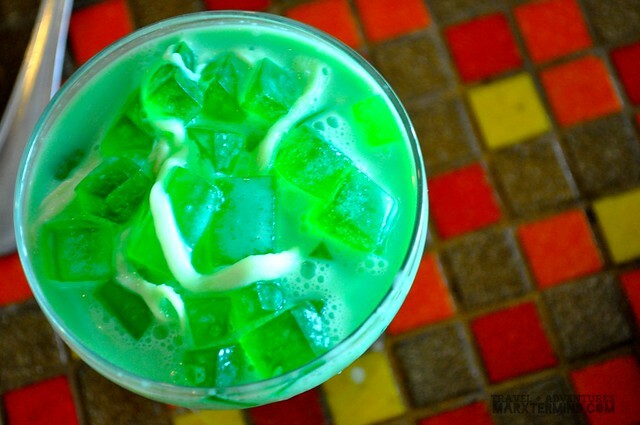 Cruz, Laguna. After reaching Sta. 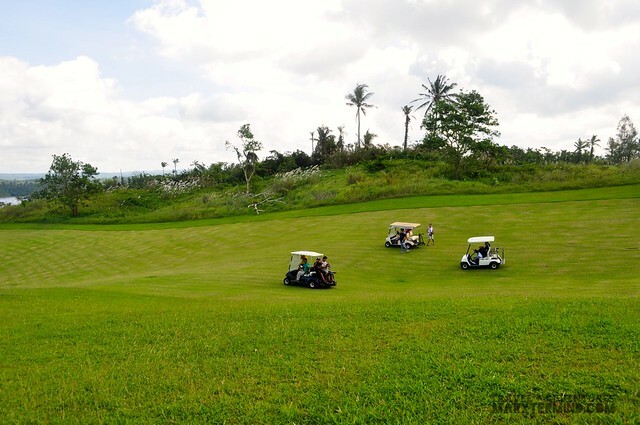 Cruz, one may opt to take a jeepney to Caliraya but an easier and more convenient way to reach the resort is through tricycle. Travel time takes about 2 to 3 hours. 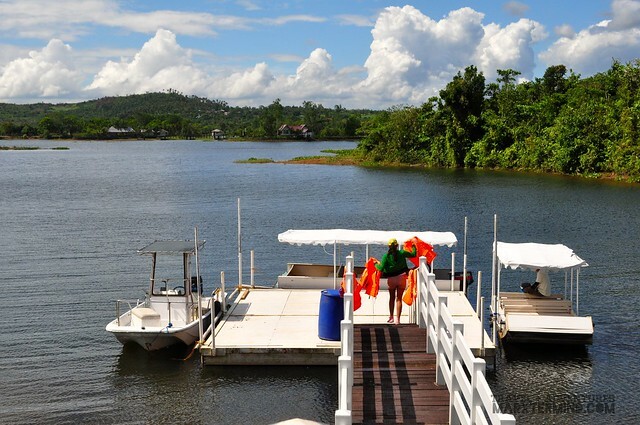 It was already nearing noontime when we arrived at the resort. We were welcomed by the staff and brought to the clubhouse area to get briefed with the things about the resort and the activities that we have for the weekend. With so many pleasant and exciting things mentioned, it suddenly came to our mind that it’ll really going to be a fun weekend. And it really was! 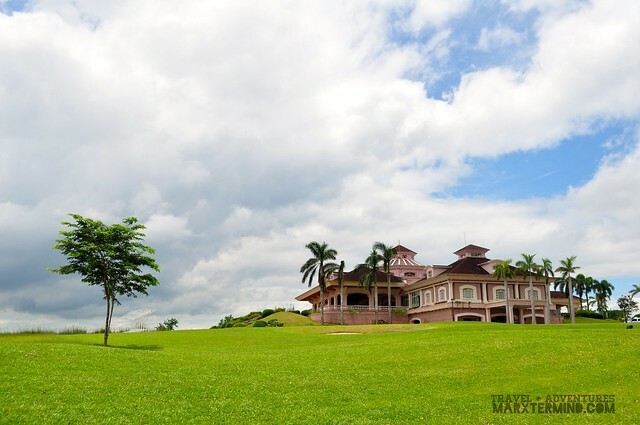 We kicked off our weekend activity by having a tour inside the clubhouse and see the amenities that Caliraya Springs has. Situated on the underground level of the building is where we found about some of the services that the resort offers. 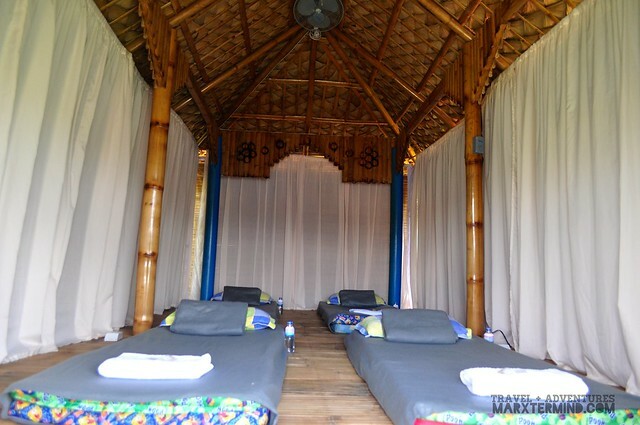 They have Jacuzzi, sauna and massage areas, things that will surely be enjoyed by guests especially after getting into some strenuous activity or sports. 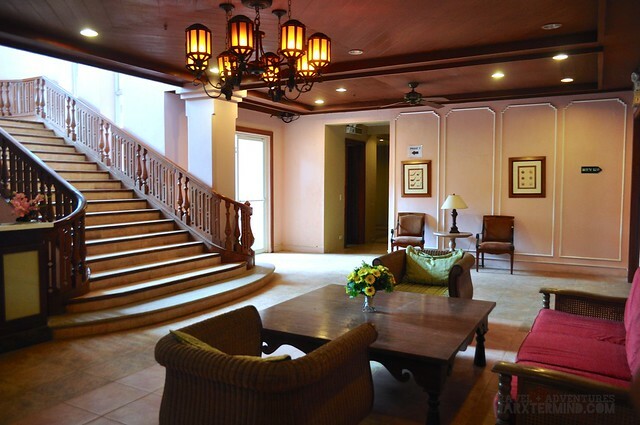 There’s also a hotel located within the building, which is named as The Residence Hotel. 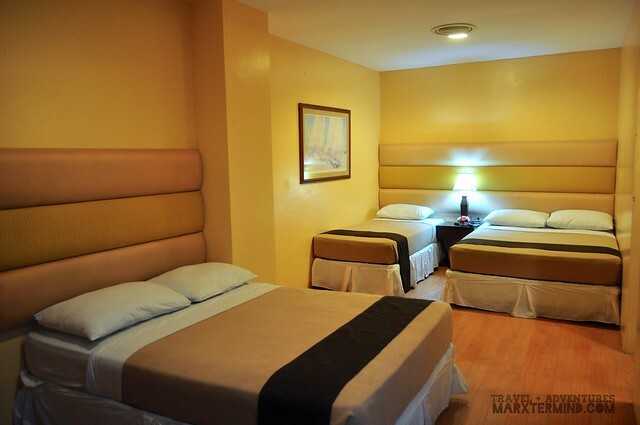 The room comes from twin sharing, triple sharing, superior suite and family suite. 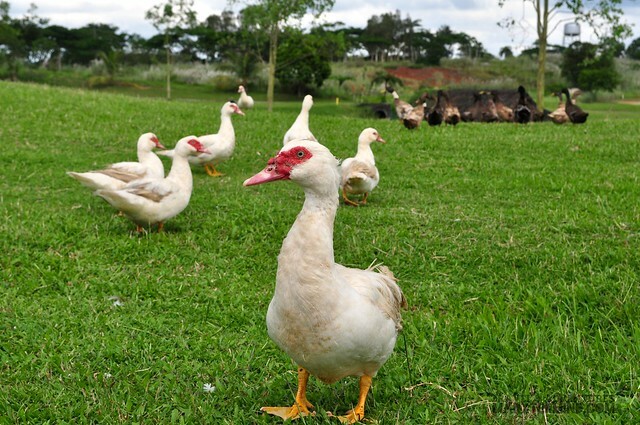 The rooms are simple and straightforward, which has the basics of what a usual hotel room has. 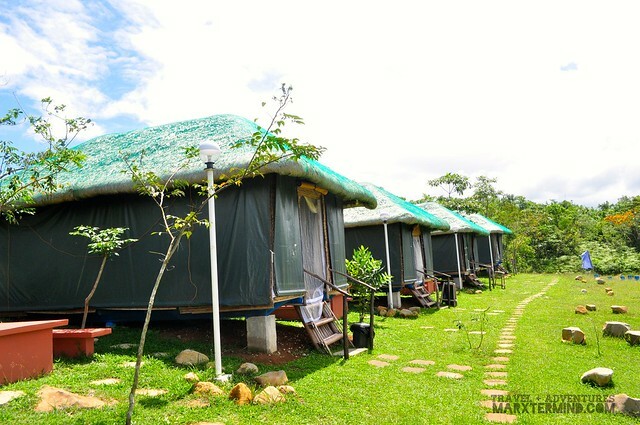 Each room is equipped with air-conditioning, private toilet with hot and cold shower, and television set with cable. 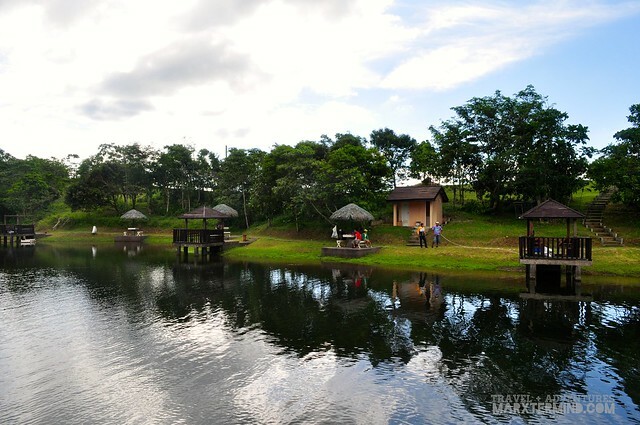 After seeing the clubhouse and its features, we went to Mountain Lake Resort – our humble abode for the weekend. I always like the laid-back feeling. It always craves me to get to places that are cozy and peaceful most especially when I get stressed from the noise and pollution of the city… well, let’s also include work when workweek gets exhausting. So when I learned about what our accommodation in Mountain Lake Resort was, I’ve got ecstatic. It has this relaxing vibe. It has this cozy atmosphere that reminds me of my trip in Pai. There was nothing lavish about the room, but its minimalism that makes it stand out. 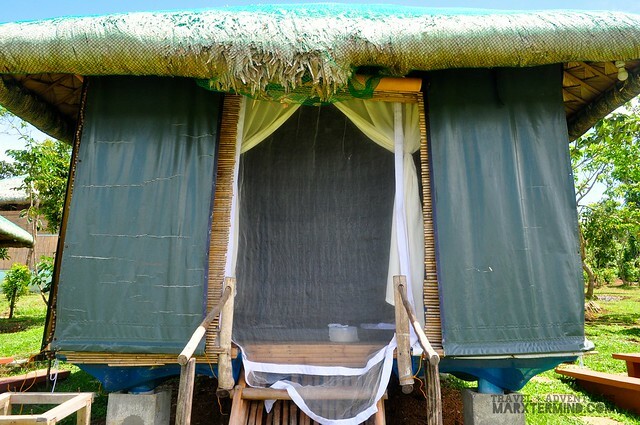 The rooms are Nipa Hut Villas provided with 4 mattresses inside, towels and bottled water. It was my liking, very homey indeed. The room has a fan. 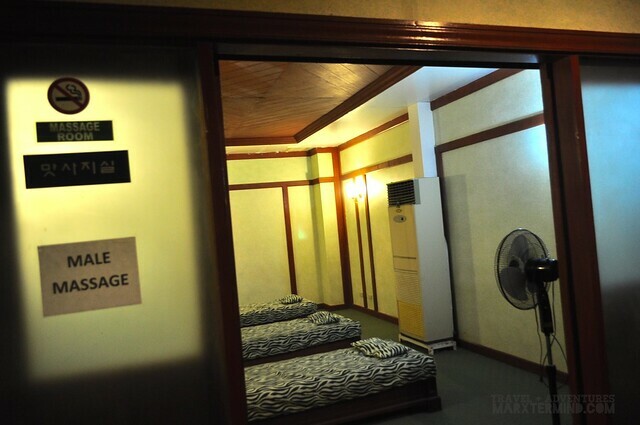 The room has electric socket so don’t worry about charging your gadgets. 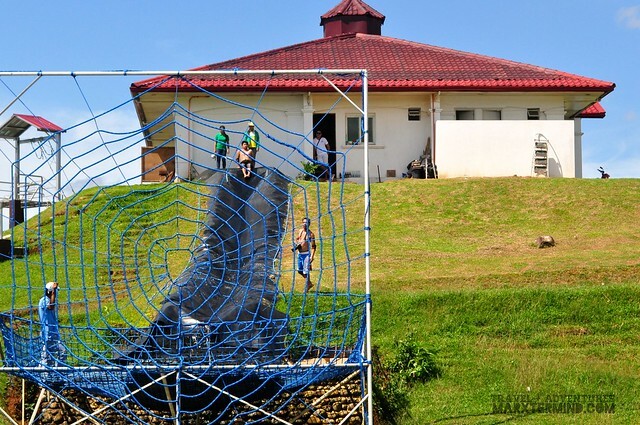 This accommodation type is good for family and for team building. Bathroom is shared which is situated at the back of the villas, which has clean and spacious shower rooms. 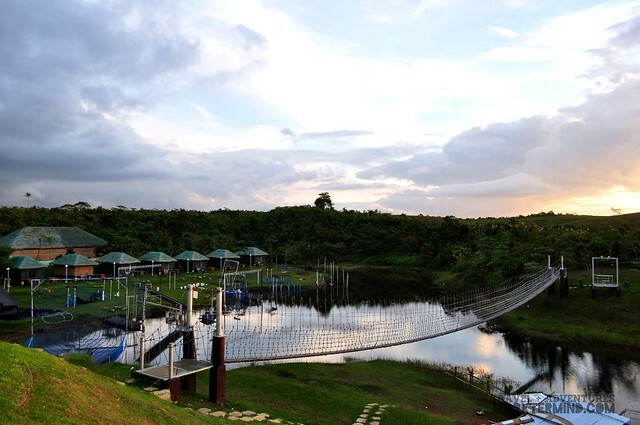 Part of out itinerary for the weekend is to try the several outdoor activities of the resort. 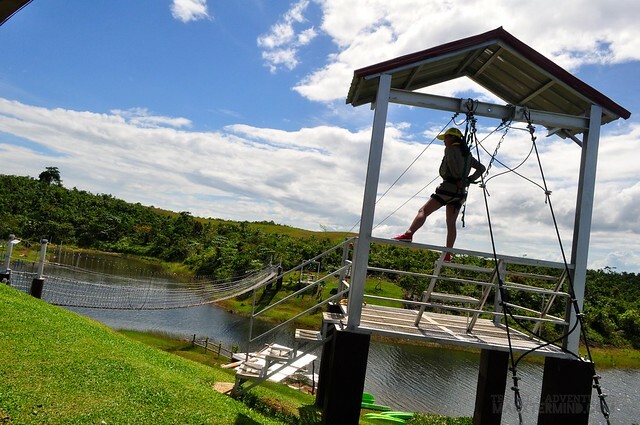 They have more than 32 attractions and activities to enjoy – obstacle course, zip line, hanging bridge, paddleboat, duck feeding and swimming pool to name a few. 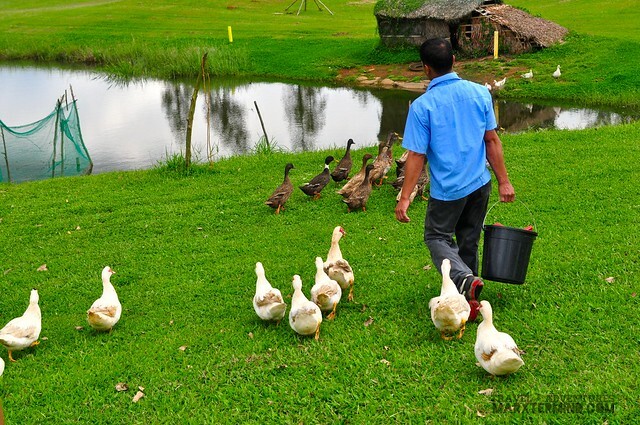 The first few activities that we did on our first day were duck feeding, Lake Cruising Boat Tour and fishing. 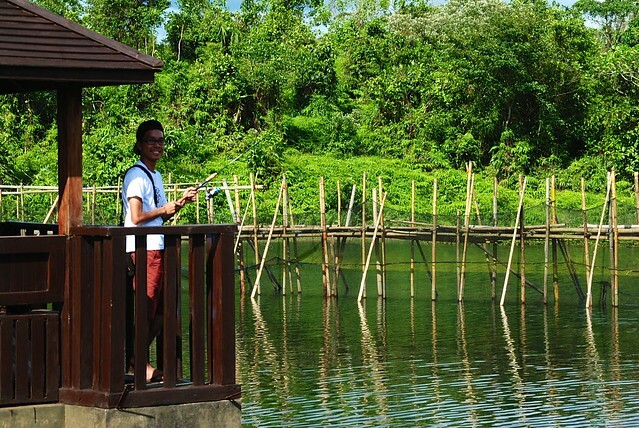 I’ve never experienced fishing before hence when I’ve heard about this activity as part of our things to do that day, I’ve got thrilled and was keen in learning how to fish. Each of us was given a fishing rod, using a pellet as our bait. Our kind guides uncomplainingly taught us how to use it and catch one. Some of us were eager to catch; so we patiently waited to get one. Unfortunately, the fish were too clever. Despite of our efforts in putting more bait and changing our spots, we weren’t able to catch one. 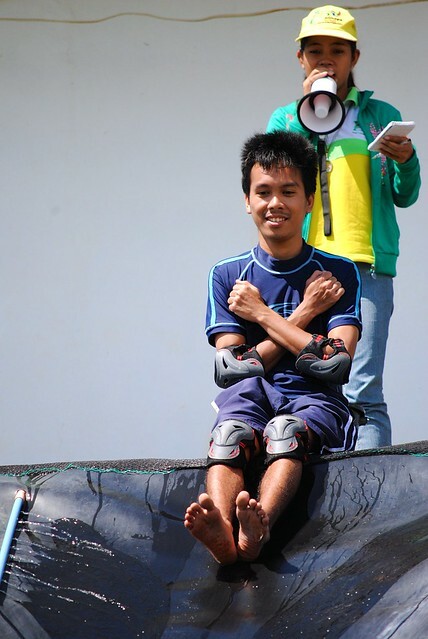 Fishing is a serious hobby, I’ve realized. It wasn’t that easy. 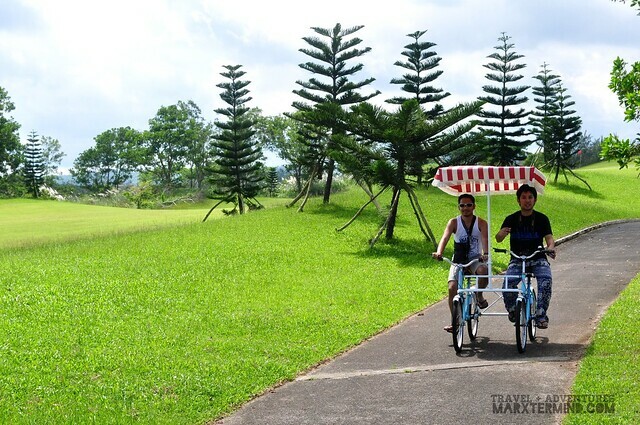 Another activity that we’ve enjoyed doing is biking. Seeing the tandem bike and parallel bike the first time when we reached the golf complex, we’ve told ourselves that we have to try those. So it was on our second day that some of us tried biking using the very unique tandem and parallel bikes. 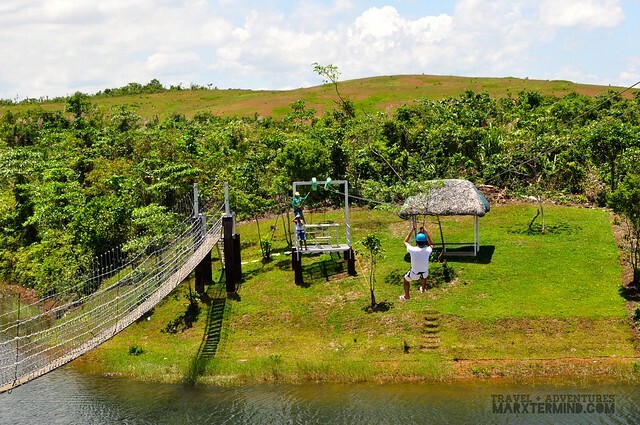 For an ultimate recreation weekend in Caliraya, some of us tried the zip line and obstacle course. 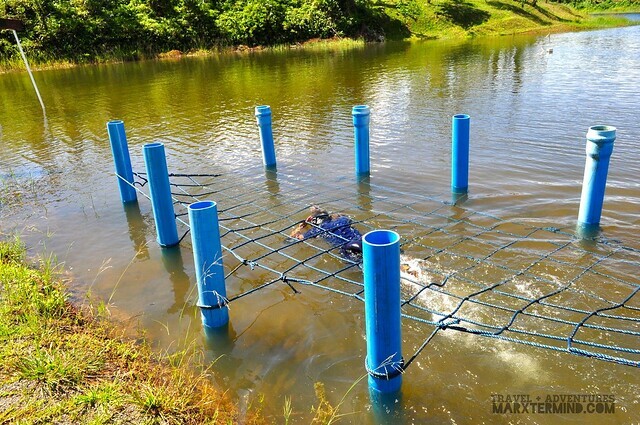 My friend did the obstacle course first to set as an example on how we should do the challenging course. 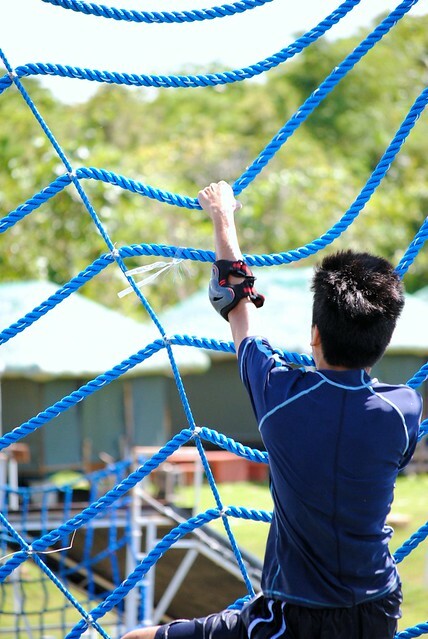 The obstacle course includes Slide & Drop, Wall Climb Slide, Tire Challenge, Cable Balance, Karate Kid, Military Crawl, Tarzan Swing, Log Crossing and Palosebo. 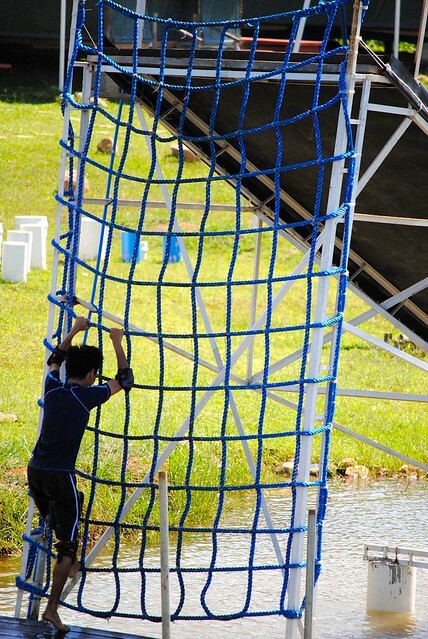 The obstacle course was exhausting, but it was really fun. 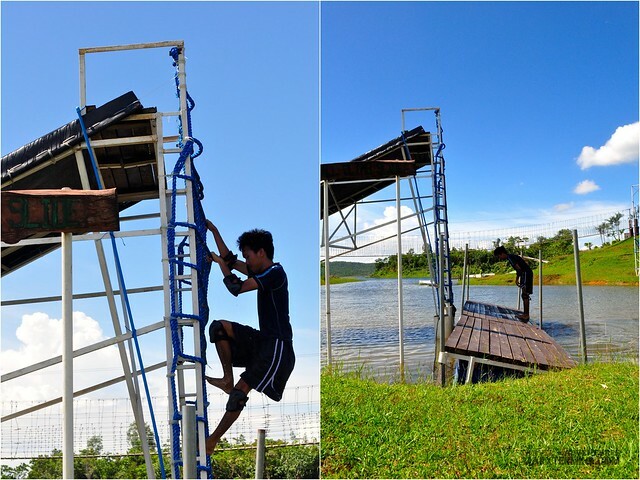 After the tiring activities that we did that day, we’ve thought that nothing was more relaxing than dipping at the resort’s swimming pool. Thus, we went to the pool area and spent our remaining time that we have there. 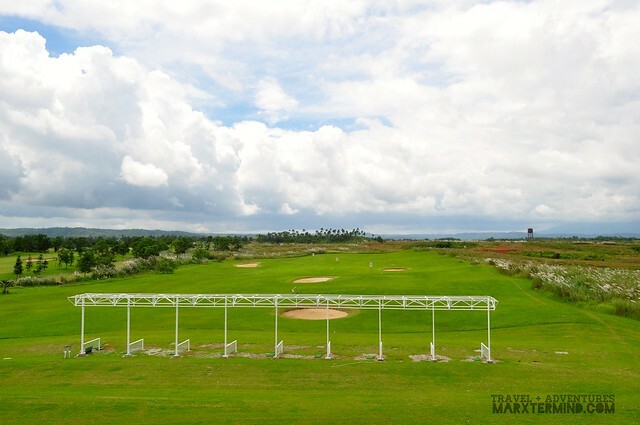 The golf complex has a resident restaurant called as La Cucina de Caliraya. 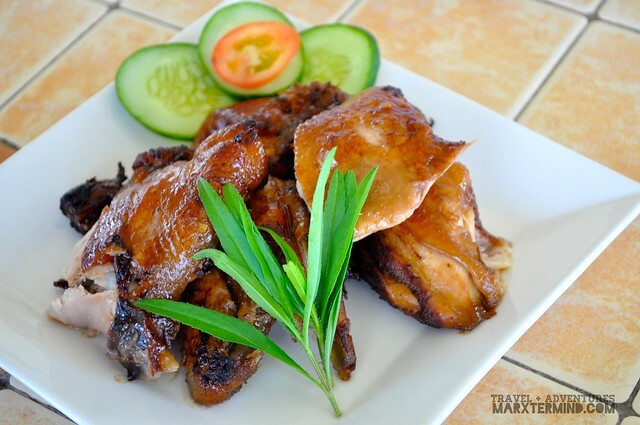 The restaurant has rooms, which is good for functions, gatherings or any occasion. They also have game room and karaoke room. 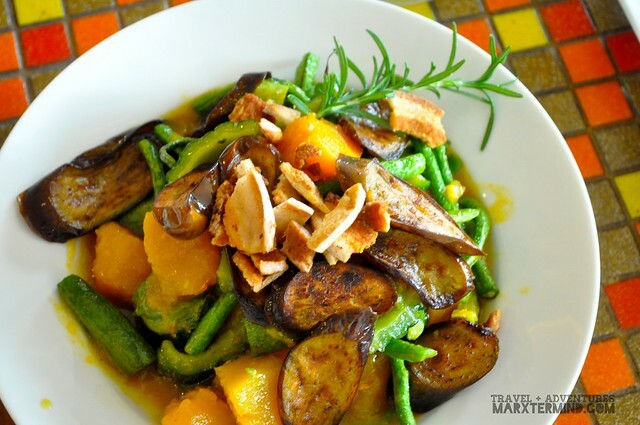 However, what is really remarkable about La Cucina de Caliraya is the food. The food, oh it was incomparable. 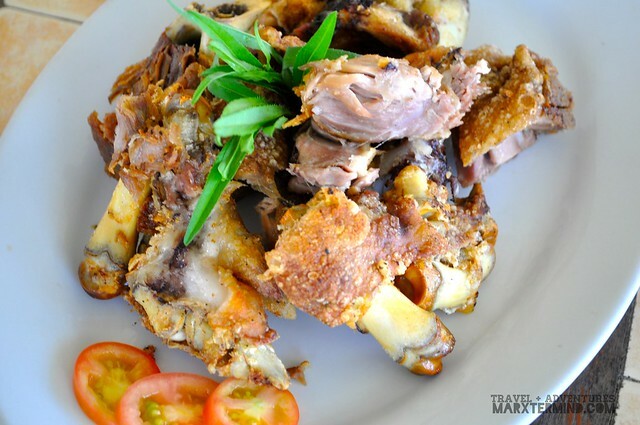 The resort has the exceptional menu of relishing Filipino dishes. 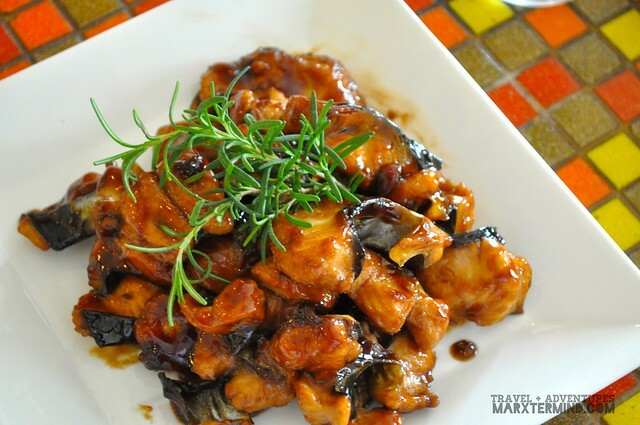 Every food that was served to us was outstanding. 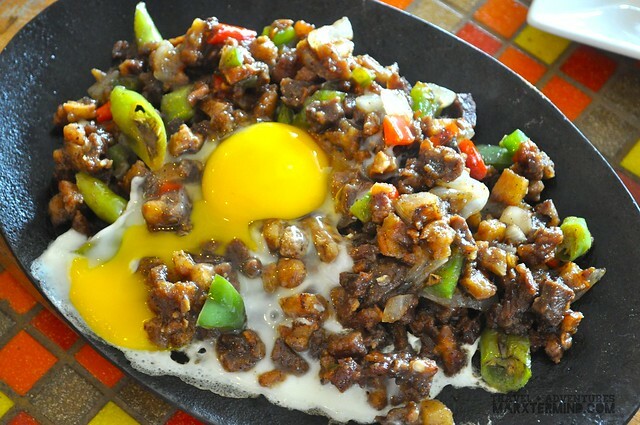 However, it was the Sisig that was my most favorite. 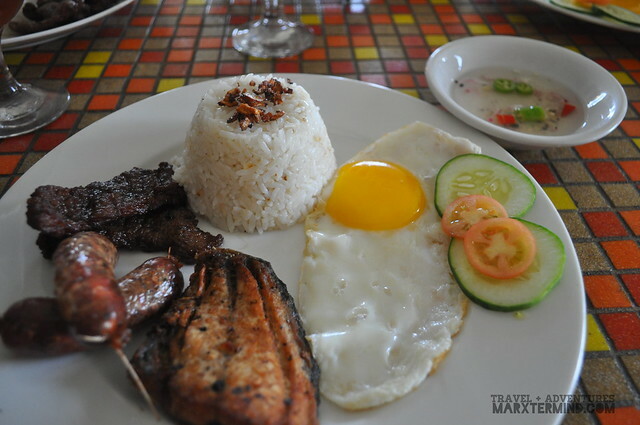 The restaurant serves meal for breakfast, lunch and dinner. 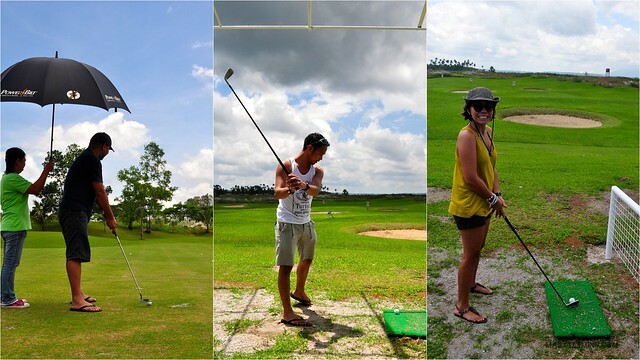 Our Sunday activity started with a tour at the golf course. 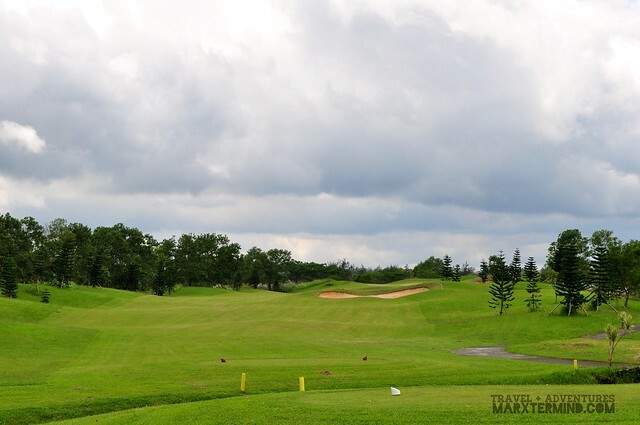 The course is an 18-hole golf course that promises an exciting experience for any golf buff. 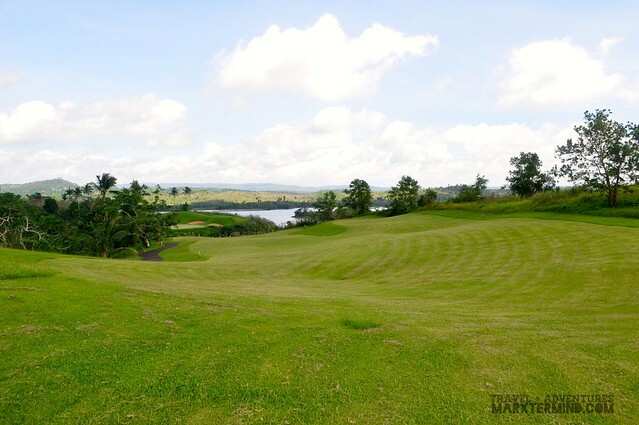 The golf course was designed by the renowned golf legend and course designer Arnold Palmer. 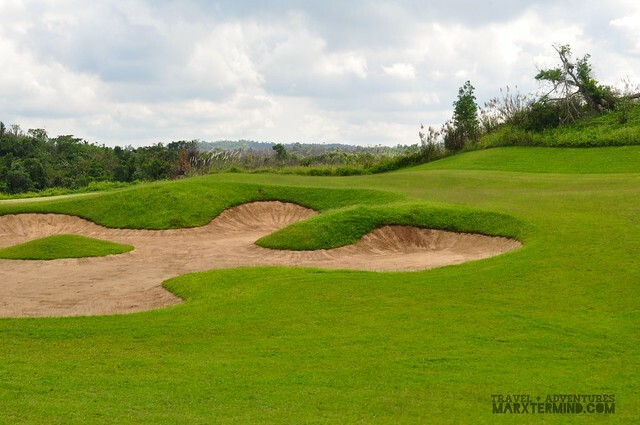 The lakeside course is occupied with uphill and downhill terrains; challenging shot lengths and captivating landscape making the golf experience even more amazing. 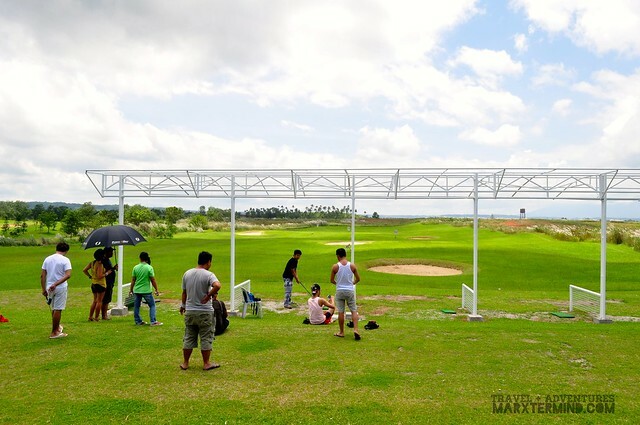 Of course, it wouldn’t be an ultimate golf experience if we wouldn’t be able to try golfing. Even though we weren’t outfitted with the right suit, we came out to the field and tried golfing. It was the first time for most of us. 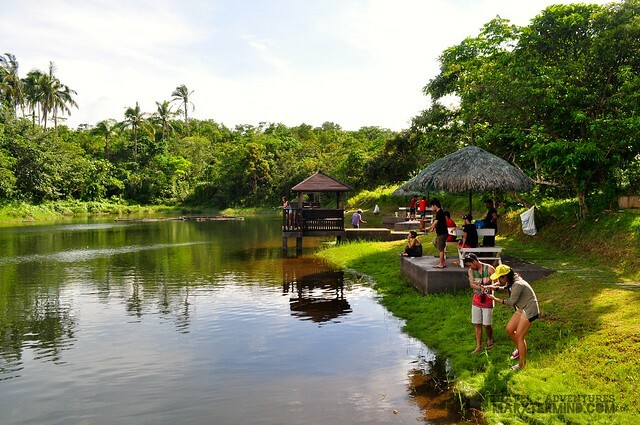 With so many things to do in Caliraya Springs, it seems that weekend isn’t enough to cover all those things. 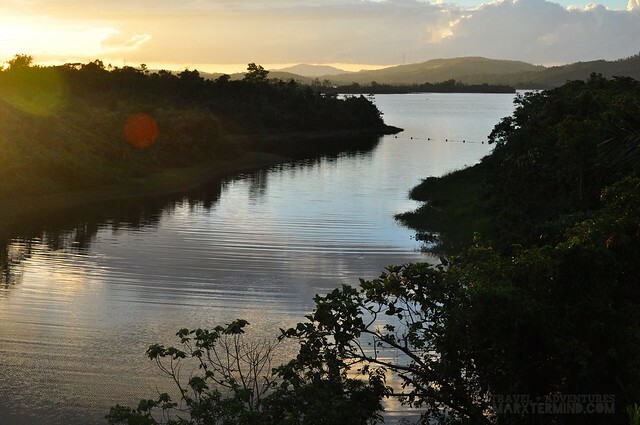 But the two-day visit had been enough to experience the rest and recreation that I was desiring. 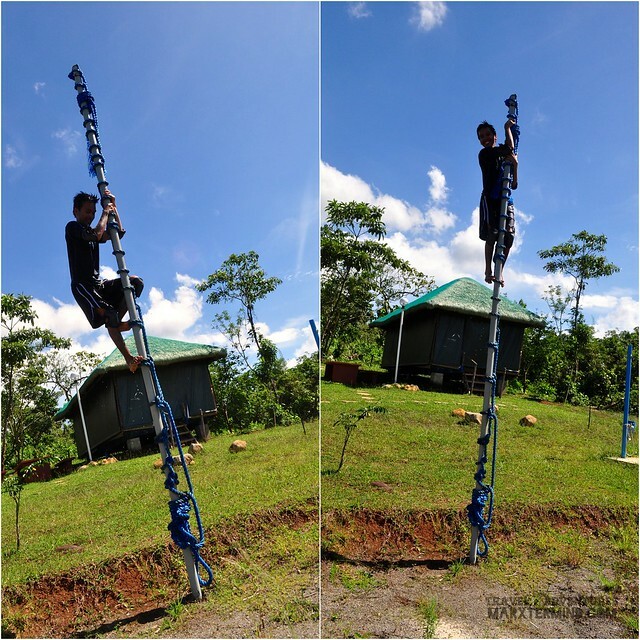 I had able to get a nice rest by staying at the resort’s unique villas and had able to do some fun recreation by involving myself to some of the resort’s outdoor activities. 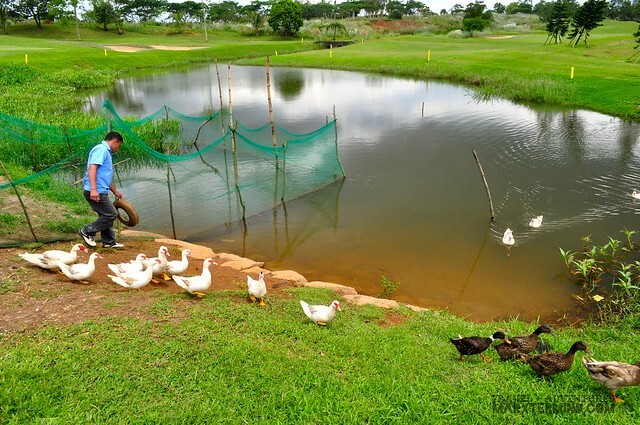 I really enjoyed my time in the resort especially that I was able to do things for the first time like golfing and fishing. Spending a weekend here was such a gratifying experience. 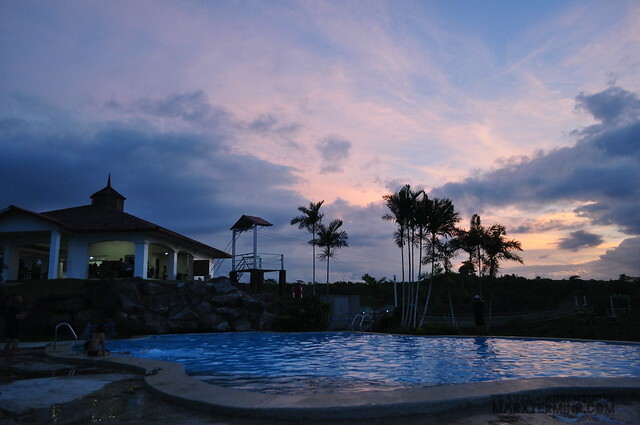 Apart from the resort itself, I was able to go and have some bonding time with most of my favourite travel buddies. Nothing’s really more fun than to be with the people you like, with a great destination as an add-on. 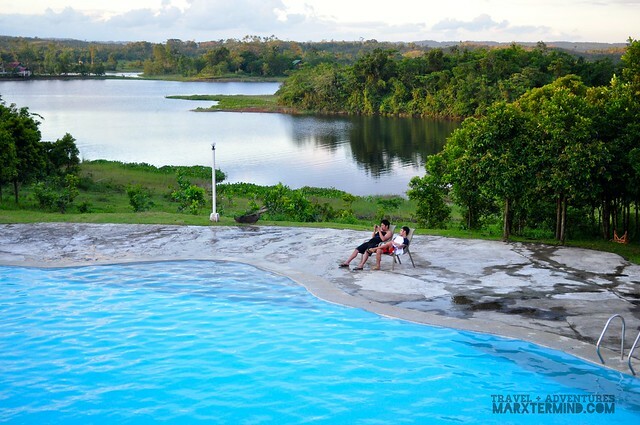 For discounts, you may book a stay on this resort through this link.